Visiting Savannah was a dream of ours. When we learned about QuestFest, we hopped on the opportunity. More than 1,000 Girl Scouts from across the country and Canada came to Savannah for the three-day event! 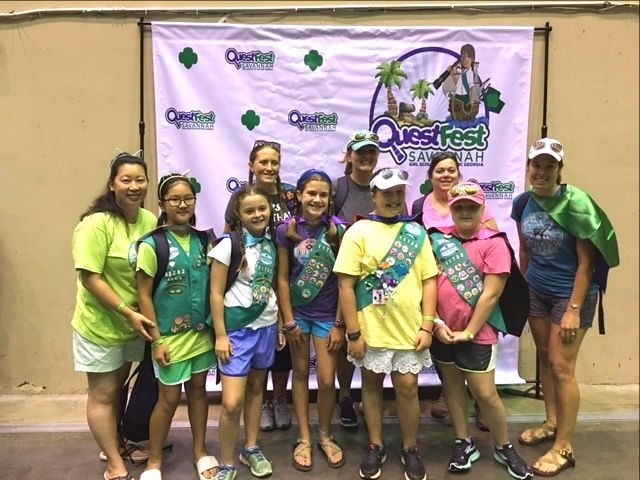 We received our team assignment a week before we were due to arrive in Savannah; we were paired up with a local troop from Girl Scouts of Historic Georgia to form a larger quest team. We were excited to meet our sister Girl Scouts, and the girls learned a little about each other over email. Upon meeting at QuestFest, the girls welcomed Madelyn to the team and they immediately exchanged swaps. The next day we descended upon the historic district of Savannah to complete quest challenges. We were given a map and over 25 quests. The girls strategized and mapped out the quests based on which ones earned them the most points. Quest challenges included singing on a public bus and recording it, performing a headstand, engaging in a water balloon fight, and reenacting the famous Forrest Gump bench scene in Chippewa Square. The girls’ favorite quest was constructing a dog house out of pool noodles. As we trekked around Savannah, we felt like we were on The Amazing Race! We felt closer than ever, and it was great to see the girls exemplify teamwork and perseverance. They were go-getters! QuestFest concluded with a huge concert celebration with Maddie and Tae. We took a selfie with the singers and got their autographs! During our time in Savannah, we visited the Birthplace of Juliette Gordon Low and Girl Scout First Headquarters. We took a riverboat cruise aboard the Georgia Queen and enjoyed the city sights. We tried peach flavored cookies for the first time and they were delicious. Savannah has so much to offer and we really enjoyed our time. We met great people, had great southern food, and more importantly made new pen pals. We are looking forward to QuestFest 2018!